I don't know about you, but I was already looking forward to the end of Winter. Now I'm eager to kiss it goodbye even more so. But why, you might wonder? 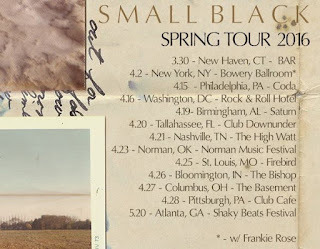 Well, friend, this week has delivered the happy news that Brooklyn's delightful purveyors of dreamy, otherworldly synth space pop, Small Black, are hitting the road when Spring once again joins us. The band is touring the pants off latest long player Best Blues, a ridiculously good listen if for some reason you've not yet checked it out. I can't wait to see how they melt faces here in DC. Don't miss this tour, y'all.